Perfect for first time gamers and thrill-seekers alike, games feature advanced storytelling, ultra-realistic enemies and epic final boss battles. Games become ultra-competitive as groups are ranked against one another based on their skill set; number of kills and deaths. Zombie Survival - Picture this: you’re bunkered in a fort and surrounded by a mass of zombies. Can you stay alive until the rescue team arrives? An experience for thrill seekers. Singularity - Ever wondered how you’d fair against killer robots and rogue drones? You and your mates will investigate a secret military space station and take on the Terminators. Engineerium - Perfect for first-timers and virtual reality experimenters. Ease you and your mates into VR through this avatar-like, fantasy world that combines platform and maze challenges. John Lilley, Chief Experience Officer at Zero Latency said “It’s long been our ambition to launch Zero Latency in the top tech hub of Europe and we can’t wait to share with Brits the UK’s first free-roam, multiplayer VR entertainment experience. There’s a growing appetite for cutting-edge socially engaging VR experiences and the games we offer cater to a wide audience from avid-gamers to first time visitors, but at the heart of every game is a family fun adventure. An innovation success story, Zero Latency is the first company in the world to launch warehouse scale free-roaming VR. 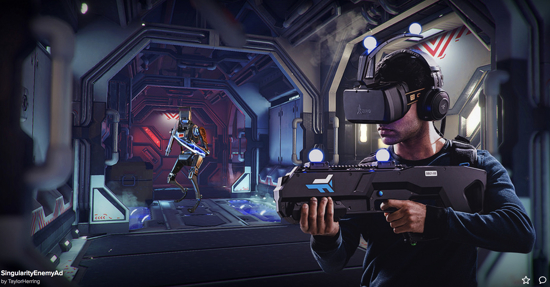 Founded in 2014, the company has 19 venues in 10 countries across four continents and so far more than 350,000 people have experienced over 550,000 free-roam Zero Latency VR game plays worldwide. Zero Latency’s Nottingham branch will open on Friday 19th October from 12pm to 10pm and is located in MeetspaceVR, North Entrance, intu Victoria Center, Nottingham, NG1 3QN. Tickets can be pre-booked at www.zlvr.co.uk from £19.95 per person.